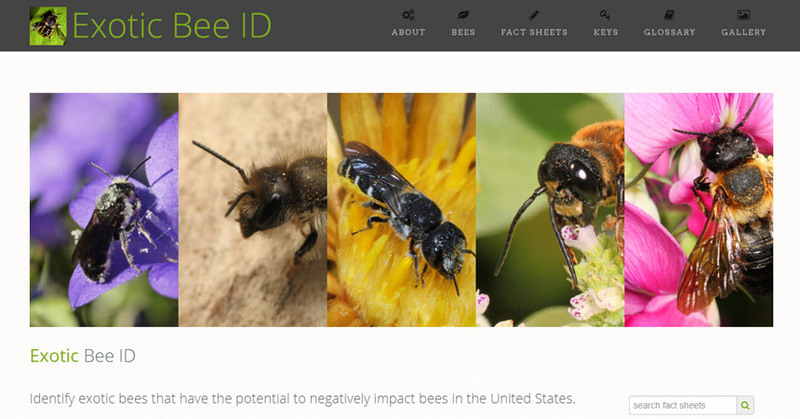 ITP is pleased to announce the release of its latest identification tool, Exotic Bee ID. Bees play a critical role in both agricultural and natural ecosystems, but some bee populations are in decline due to habitat loss, pesticides, parasites and pathogens, and the introduction of non-native species, including non-native bees. Exotic Bee ID was designed and developed as an interactive screening aid to help those that monitor and intercept non-native bees in the U.S. Our intention is to help reduce the loss of valuable native pollinators through early detection of possible invasives. This identification tool focuses on bee families and genera that include non-native bee species that have already been introduced, or have the high potential to invade, the U.S. Exotic Bee ID is aimed primarily at individuals working at ports of entry, state departments of agriculture, with university extension services, and non-experts with an interest in learning features that are important in the identification of native and non-native bees.